The tragedy of the commons dates all the back to Aristotle. It is the story of humans depleting and destroying the free gifts of the world. There have been many incidences of other commons being destroyed like, the Black Sea, depleted fisheries, and other parts of the ocean. The United Nations set up a treaty that regulated these commons to hopefully ensure that these resources and areas would be better preserved for future needs. The treaty specifically addresses pollution and resource extraction of common waters, placing limitations on drilling activity and how these areas are to be maintained. The one problem with this treaty is that it does not directly apply to enclosed seas. 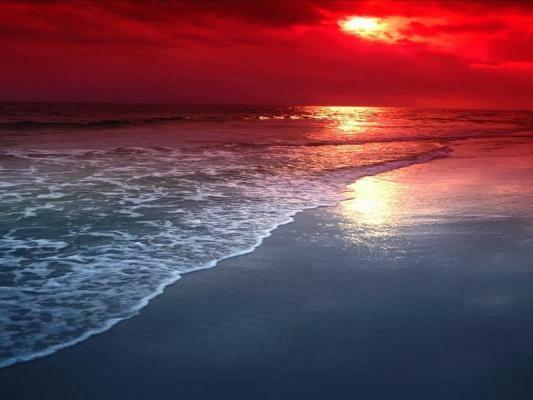 Most enclosed seas are completely surrounded by one country, but the Caspian Sea is one of the exceptions. Since five countries surround it, there are many disputes on how to handle possession and resource distribution. 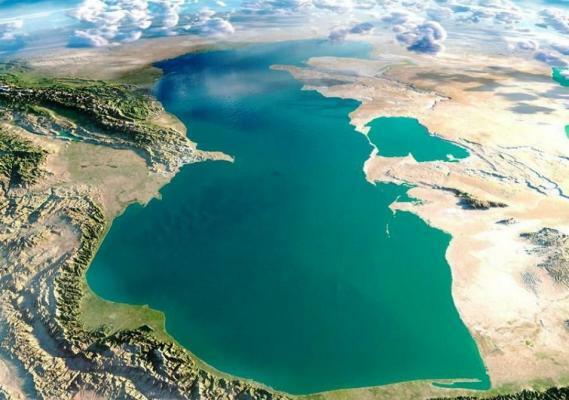 This paper describes the history of the Caspian Sea, and the problems associated with it trying to become a major oil and natural gas contributor to the world economy. The Caspian Sea is a body of water completely surrounded by land and has no other outlet to any other large water source. Before the dissolution of the USSR, the Caspian Sea had only two states that controlled its territory, which were Iran and the USSR. The Soviet-Iranian Treaty of 1935 and 1940 gave each party “exclusive right of fishing in its coastal waters up to a limit of 10 nautical miles” (Exchange Notes 1940). Although this original provision had nothing to do with the seabed and subsoil resources, there was an understanding that any further exploration off the 10 nautical mile mark was still in the interest of the USSR and Iran even though the rest of the sea was considered a commons. During this time of further exploration, both the USSR and Iran filed no formal complaints of impeding on each other territories. The Soviet-Iranian treaty of 1935 held its purpose until the break-up of the Soviet Union in 1991. With the addition of three more littoral states, questions of subsoil and seabed resources and export became a whole new international dispute (Clagett 1995). What once belonged exclusively to two nations was now a fight to gain control of some of the most plentiful oil and natural gas reserves. The reason why the law of the sea is not directly applicable to inland seas in its entirety is that freedom of navigation, one of the main principals of the law of the sea, does not apply to enclosed seas, but there is no reason why other certain aspects of the law of the sea should not be applied to inland seas. In particular, the rule that the seabed and subsoil resources should be divided in accordance with a method that ensures equity and proportionality is entirely appropriate for inland seas. 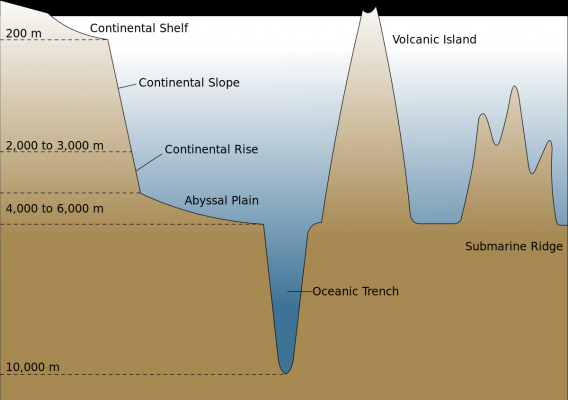 International law in this century has come to recognize exclusive rights in seabed and subsoil resources precisely because it has become technologically possible to exploit those resources. With further exploitation, some means of fair distribution rights of the inland seas needs to be recognized and agreed upon (Clagett 1995) (Ivy 2002). It seems that the distribution of the Caspian Sea may be the easy part to the economic dilemma. The Caspian region, after the fall of the USSR, was left to economic ruin. The independent states that arose from the split up of the Soviet Union were left to survive in the cruel world. Most of the new countries struggled to keep up with educational practices and the increases in the cost of living, so they soon found themselves in poverty. Children that would usually attend schools through the 12th grade would now only go until the 9th grade, pouring millions if young unskilled “adults” into the jobless world, adding to the poverty. The plentiful resources of the Caspian Sea were supposed to be a gold mine to these newly formed countries, but because of lack of capital to extract and export the resources, the new countries found themselves selling parts of the valued Caspian region to countries at a less then adequate price. The five surrounding countries, other than Iran and Russia, are completely landlocked and depend on other countries to aid in the exporting of their goods. The break up of the Soviet Union, was supposed to be a blessing for these new countries, however they are unable and are ill equiped to survive and support their own economies. “Few leaders of the new Caspian states had any practical knowledge of international finance or trade- so they took advice from the sources at hand- prominent Western business executives and politicians” (Olcott 1998). The countries were desperate for money and felt that they had few options. They had to do what was best for their country to have a chance and survive. Even bribes were predominant throughout these independent states, making it difficult to negotiate legal deals for the valuable resources. Even the United States contributed to the difficult task of exporting the resources by imposing U.S. sanctions on countries whose firms trade with Iran, limiting export options for the other countries. 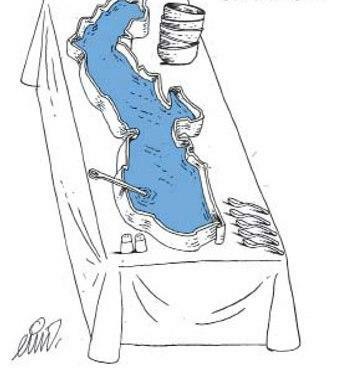 Dividing the Caspian Sea equally has exposed some problems. 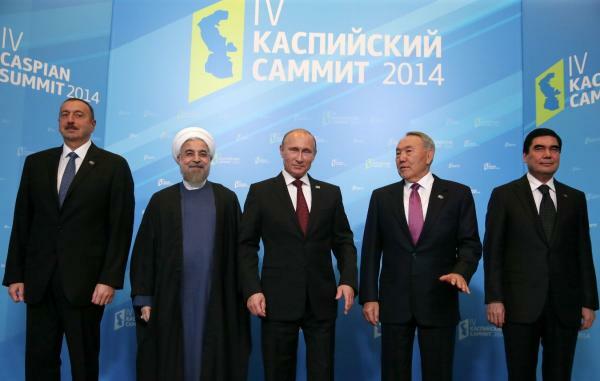 In addition to Iran, the region now has the USSR being represented by four littoral states. 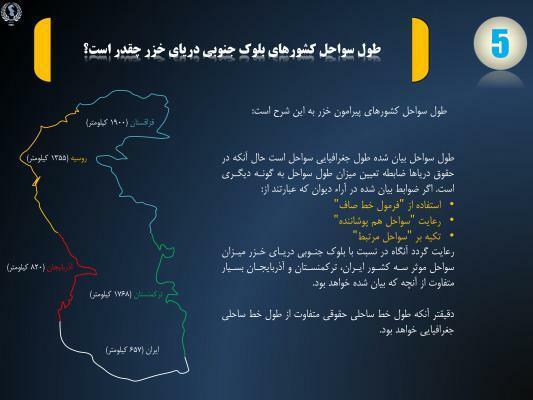 The simple decision of dividing in half what used to belong just to the USSR and Iran is no longer that simple. The original treaty of 1935 would have Iran receiving half of the land, while the four remaining states split the rest of the remaining 50%. This solution is of course unacceptable. 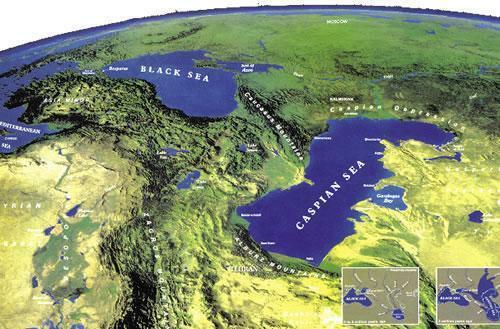 The new nations want what is rightfully theirs because they all border the Caspian Sea. International law has developed a system that actually originated with lakes and rivers. 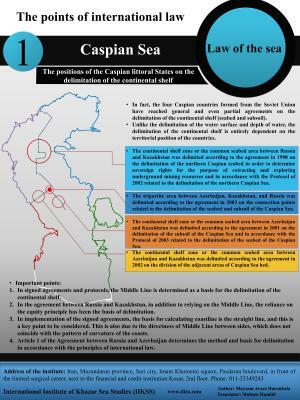 In these circumstances, a court would use three different methods to allocate the valuable resources and territory of the Caspian Sea. The first method is a general principal of international law, which is commonly known as the equidistance rule. The other two methods that are considered for delimitation between adjacent states are the drawing of lines perpendicular to the general direction of the coast or the bisection of an angle formed by the coastlines of the two states. Using a combination of these methods, a court would draw lines establishing a tentative boundary and then conduct a proportionality study. If the results of the study are within an adequate degree of proportionality, the court will adopt these boundaries provided there are no historic rights to the area that could alter the tentative boundaries. The final results are shown below in Table 1. The economies of the five surrounding nations are heavily invested in the resources of the Caspian region, however they have very few options to export these resources to other regions of the world. “The sea, which is 700 miles long, contains six separate identified hydrocarbon basins, although most of the oil and natural gas reserves have not been developed yet” (EIA 2002). Developing these resources is not the problem; exporting the resources so that the three new nations that have developed can economically profit from their resources is what hinders the situation. The United States wants to see as many different pipeline routes as possible to prevent any one country from developing a stranglehold over the flow of oil from the region (Carvalho 2002). 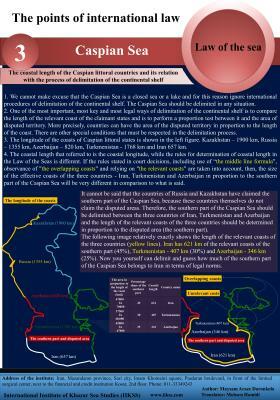 Russia, however wants to ensure that most of the Caspian oil would go via its territories (El-Saghir 1998). 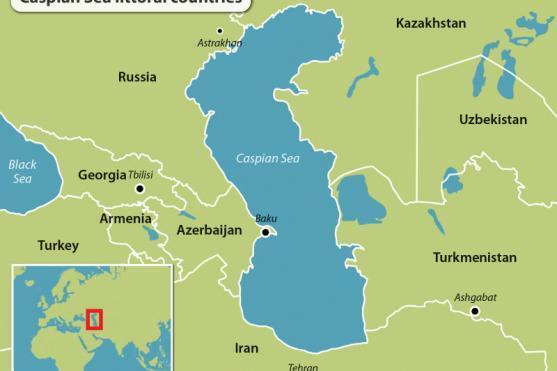 Total oil reserves of the Caspian Sea region, are estimated to be above 200 billion barrels, exceeding that of Western Europe and the Untied States, placing it second behind the Middle East. “The bulk of this production potential will come from Azerbaijan and Kazakstan, the two countries with more than 80% of the expected oil reserves and where 85% of the foreign investments in the region are concentrating” (El-Saghir 1998), see table 2. Prior to 1997, exporters of Caspian region oil had only one major pipeline option available to them, the 240,000-bbd/d Atyrau-Samara pipelines from Kazakhstan to Russia. 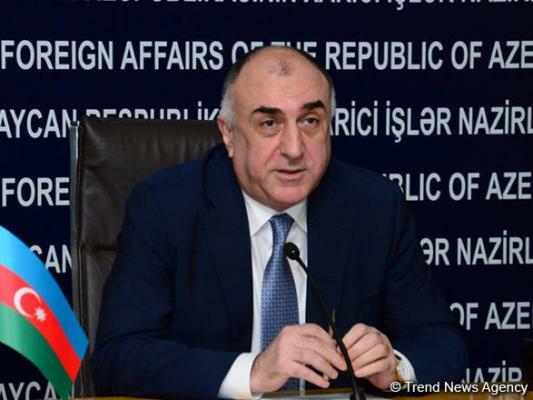 Other options have been opened since then, but nevertheless, the Caspian region’s relative isolation from the world markets, as well as the relative lack of export options, continues to hinder exports outside the former Soviet republics. Of the 920,000 bbl/d exported from the region in 2001, only about 400,000 were exported to consumers outside the former Soviet Union. Natural gas exports from the Caspian region have been even more limited. All of the export pipelines from the region pass through Russia requiring Caspian region natural gas exporters to negotiate with Gazprom, the Russian monopoly that owns the pipeline in order to export their natural gas. 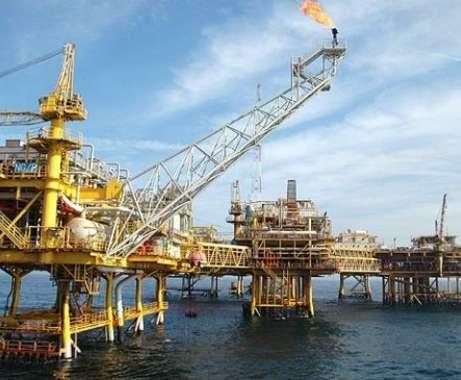 The company had used its position to negotiate better deals and to limit pipeline access for Caspian region natural gas. 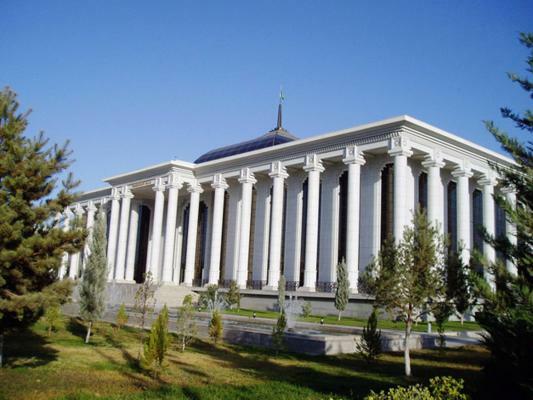 Turkmenistan’s economy, which is concentrated mainly in oil and natural gas, experienced a huge 25.9% decrease in its gross domestic product in 1997 when Gazprom denied Turkmenistan access to its pipeline network over a payment dispute (EIA 2002). With these limits, the Caspian region producers have had two options; “either sell their natural gas to Russia at below-market prices or pay Gazprom a transit fee, then export those supplies via the Russian pipeline system, see Map 1, to ex-Soviet states that cannot pay fully in cash or are tardy with payments for supplies already received” (EIA 2002). Another concern that is putting pressure on the construction of a pipeline is the strict maritime regulations of the Bosphorus Strait. Without the addition of the Caspian oil, the strait seems to be at full capacity for transporting crude products to the Mediterranean and the rest of Europe. 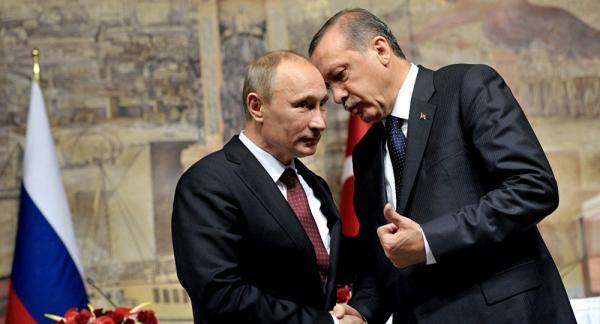 “Two-thirds of traffic is caused by three countries Turkey, Russia, and the Ukraine” (Nitzov 1998). In 1936, the Convention Regarding the Regime of the Straits, also known as the Montreux Convention, gave Turkey the right to regulate traffic through the strait. In 1994 Turkey implemented many rules that must be complied by so that passage can be granted in the Strait. The rules consist of standards for average passage time between ships, average distance between ships passing, and average speed while navigating through the area. These rules make it harder to increase the capacity of ships that can go through the Strait. If the rules were changed to accommodate the increase of oil coming from the Caspian Sea, everything would work. Turkey wants to keep the strict regulations because of safety issues. The Strait can physically handle the increase of transport, even though it is very narrow. 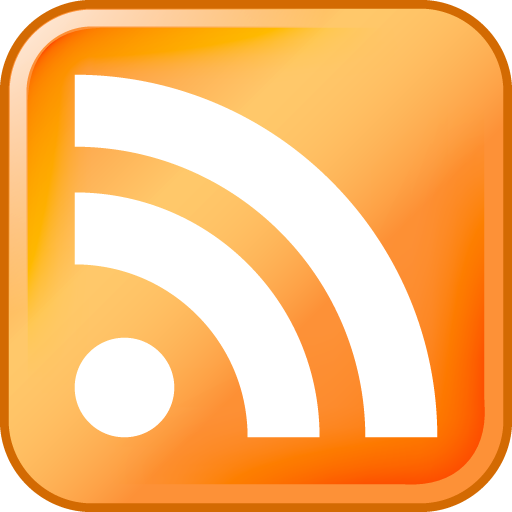 The problem is that it raises many safety concerns. Turkey insists that the strict regulations are only because of a concern for pollution and the 10 million people that live along the Strait. Any type of spill or collision would be devastating for the area. Even with the limited passage, countries still choose to ship oil through the Bosphorus Strait because it is economically their best choice. It may be slower and cause problems because regulation sometimes denies passage, but it is about one U.S. dollar cheaper to use the Strait then to use the already existing pipelines. Turkey would try to adjust the regulation to best accommodate the shippers, if they would agree to internalize the cost, so that money could be used help protect the area of the Strait. With the Bosphorus route being so much cheaper then the pipelines, countries will do anything to export or import their products this way. 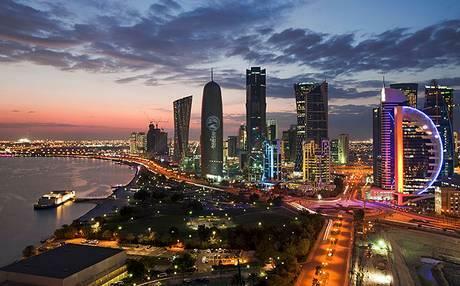 This is why the addition of pipelines throughout the Caspian region is in demand. The Bosphorus Straight will not allow for the increase of passage, so other means of transporting the oil are needed now, more then ever. 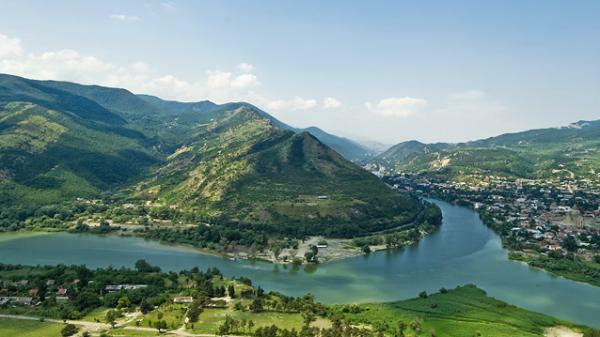 Even though the main issue is exporting the resources, there are still other important issues dealing with the environmental care of the region. “Industry, oil production, and transportation have been the source of severe air, water, and soil pollution” (EIA, 2000). 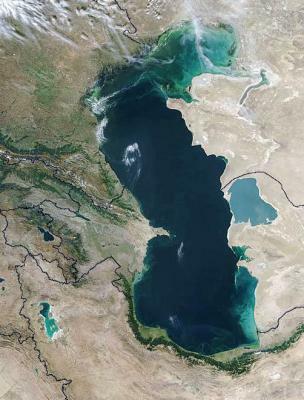 A long history of contamination and the increased economic pressure to extract resources faster will result in increased threats to the Caspian environment. The immense pollution has been a prominent because of poor technology being used to extract resources. With the new oil rush in the Caspian region, there is hope that involvement of Western companies using more up-to-date technology will lead to a small environmental improvement. This improvement is greatly needed because human lives are being threatened. In Kazakhstan tests have shown blood disease, tuberculosis and other diseases are four times more common in the Caspian area. Extraction of resources in not the only cause of the pollution in the area, the Volga River, which half of the population of Russia drains its sewage into, is not helping the cause. 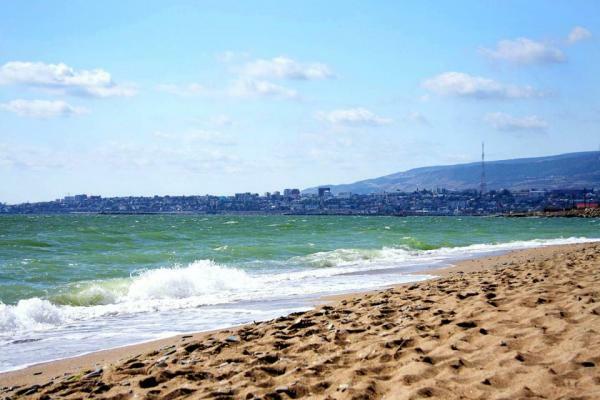 A threat of sea level rise threatens people’s homes on the shore of the Caspian Sea. There has been an increase of 7.5 ft. since 1978 due to “changes in water regime, hydrochemical regime of river mouths, dynamics and chemical composition of groundwater… petroleum products, synthetic substances, radioactive isotopes, and other substances” (EIA, 2000). 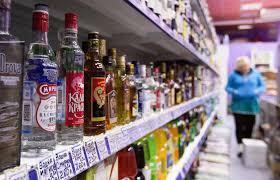 These effects have left up to 100,000 people in coastal cities and towns homeless and at risk of disease. Of course complicating the environmental problems is the large dispute of who has legal rights and responsibility to the Caspian resources. 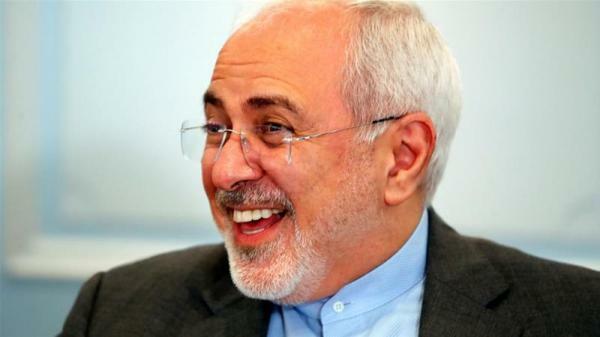 Russia and Iran have opposed proposals of pipelines on the argument that they would harm the environment. Most people feel that Russia and Iran just want to keep the bulk of export going through their territories so that they have more control over the distribution of the resources. 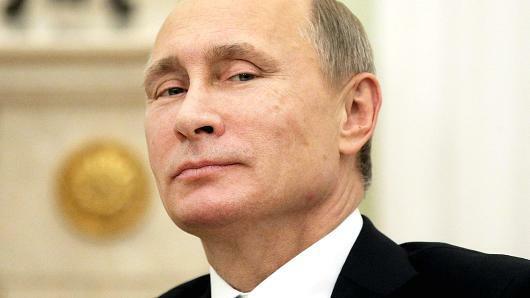 Because pipelines due in fact contribute to the pollution of the water, Russia and Iran have been able to delay considerations for many proposed pipelines that could relieve and help the economies of the newly formed countries. Environmental concerns are just another factor that hinders the rise of the Caspian region as player in the international economy. With the desolate state of the economies and the lack of funding in the Caspian region, I see the Caspian region as a six-year-old child with $20 and no ability to spend the money. These young countries have no idea how to escape economic ruin and establish a network of international relationships. 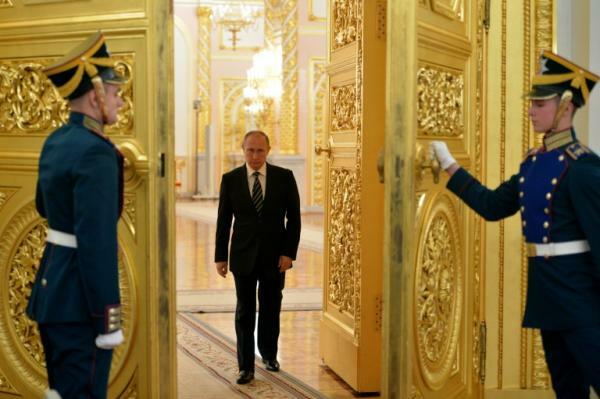 They have gained their independence but still answer to Russia because of their geographic hindrance. International regulations are trying to help maintain the area. The war in Afghanistan has helped the United States get its foot in the door. 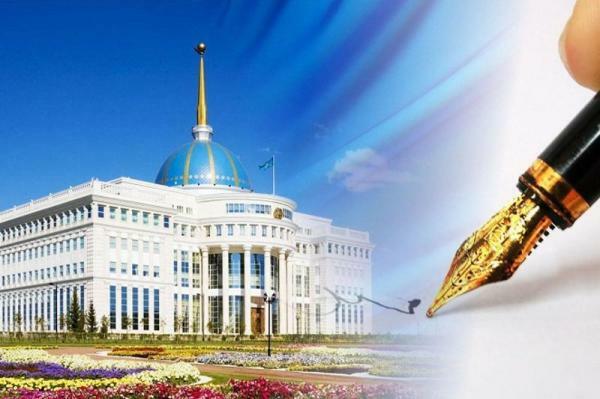 In the near future the goals of the counties in the Caspian region will be to establish a degree of economic stability through the exportation of their natural resources. 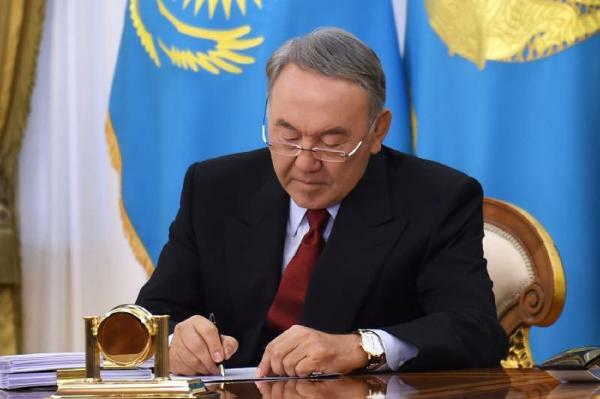 With the help of outside aid and a bit of good fortune, the Caspian Region can hopefully capitalize their resources and place themselves on the world market of international trade. 1. 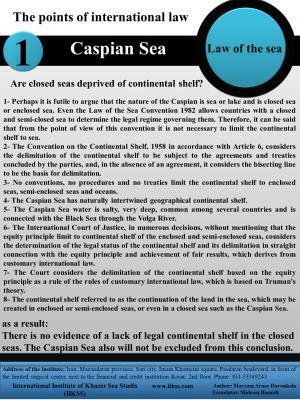 Clagett, Brice M., “Ownership of Seabed and Subsoil Resources in the Caspian Sea Under the Rules of International Law,” Caspian Crossroads Magazine, Volume 1, issue 3, Fall 1995. 2. El-Saghir, Khalil. “Caspian SeaRegion: The Checkerboard of Oil and Minefields,” University of Michigan; Summer 1998. 5. Carvalho, Stanely, “Oil and the Gulf,” Gulf News, Sunday October 20, 2002. 8. Olcott, M. B., “The Caspian’s False Promise,” Caspian Sea Library, Foreign Policy, Summer 1998. 9. Nitzov, B., “The Bosphorus: Oil Through Needle’s Eye,” Caspian Sea Library, Institute for Energy Economics and Policy, Sarkeys Energy Center of the University of Oklahoma, December 1998. 10. Ivy, A., “International Law of Enclosed Seas,” Ocean Policy, September 2002.